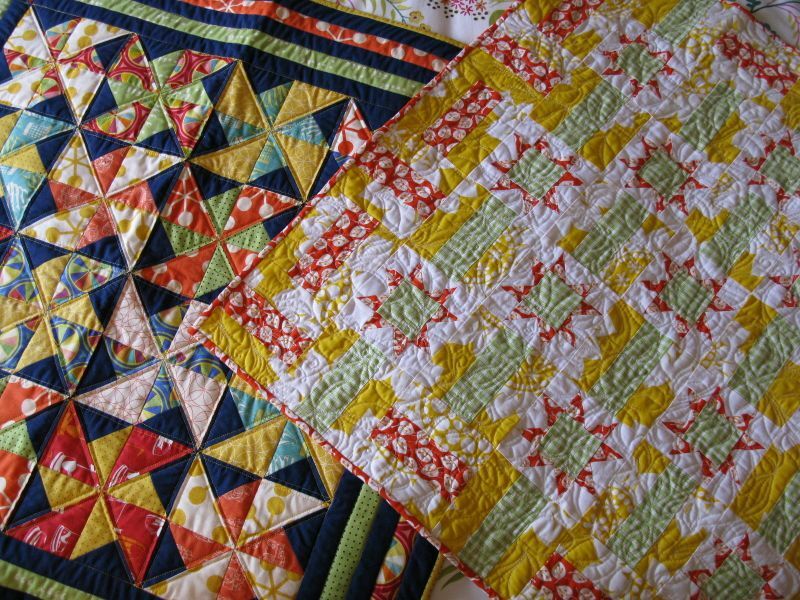 Posted on July 21, 2013 by Elizabeth E.
This is a simple Schnibbles quilt, with rail fence and sawtooth star blocks, in bright citrusy colors. The back, with my sister’s gift of a tea towel as part of the backing. As I was at our annual summer retreat, I chose a simple leafy pattern–one I could quilt while we talked about children, grandchildren, hymn-singing at church, marathons, and could-you-please-bring-me-a-piece-of-chocolate sort of conversations. I was tired today, after nearly two days at our retreat, so no big fancy quilt labels for this one. Just handwritten in Micron pen, the title, my name, the place, date and dimensions. Truthfully, this is 31 and three-quarters-inch wide, but just couldn’t face all that, so I’m calling it 31-1/2″ inches square. Here are the last two Schnibbles I’ve made. I’m thinking that whatever the next pattern is, it needs to be pink. Or aqua. Anything but yellow, orange and green. The house was quiet this morning as I sewed on the binding. My husband had not yet returned from his scientific meeting. The weather was cool so I had the windows open, listening to the faraway sounds of traffic, the nearby sounds of insects, birds, a dog barking his good morning. I could have machine-stitched this binding down, the chunk-chunk of the needle going through so many layers of fabric, but instead, I picked up a needle and thread. I thought about all the conversations I’d had in the past forty-eight hours at our annual summer retreat. The topics of conversation varied from books to quilt tops to sewing pillowcases to “how do you make bias binding?” to no conversation at all as we concentrated on our tasks, letting others carry the call and response around us. There is something so rich and rewarding about being in the thick of this, of feeling surrounded and accepted by all these creative, productive and interesting people. We have all brought our fabric, thread, and know how to borrow each other’s books for patterns, search Pinterest or the web, or locate what we want in a magazine or on a blog. We all seem to find the time to begin the quilt or table runner or creamy white blouse or Polaroid blocks and bring them to the communal sewing circle, so we can keep our hands busy while we solve what really is on our mind. The machines hum a nice alto line while our chorus of soprano voices slip in those concerns and cares that worry us at night, all of us telling a story of being unable to sleep because a friend moving away, or how to find the money to go to another state to meet an adult child’s sweetheart, or how to recover from a foot injury, or recover from a broken heart of a life called away too soon. The stories are as varied as we are, from new mothers (am I doing this right?) to mothers of teenagers (can I send them to the moon?) to mothers of grown children (everything will work out). We are young, running marathons. We are older, with a litany of physical complaints. We are professionals, earning retirement and benefits, and we are under-employed, wondering how to find medical insurance. We are so different. We are the same, with thread and scissors and stars and triangles and squares of cloth. After days of sewing together, we are tired and head back to our houses with our half-finished projects, our conversations, our new friends, our memories, all packed away until the next time. All of this is on my mind, as I think about how this is being repeated at every retreat, every sewing circle, all of us being bound together like this quilt I am working on, a stitch at a time. 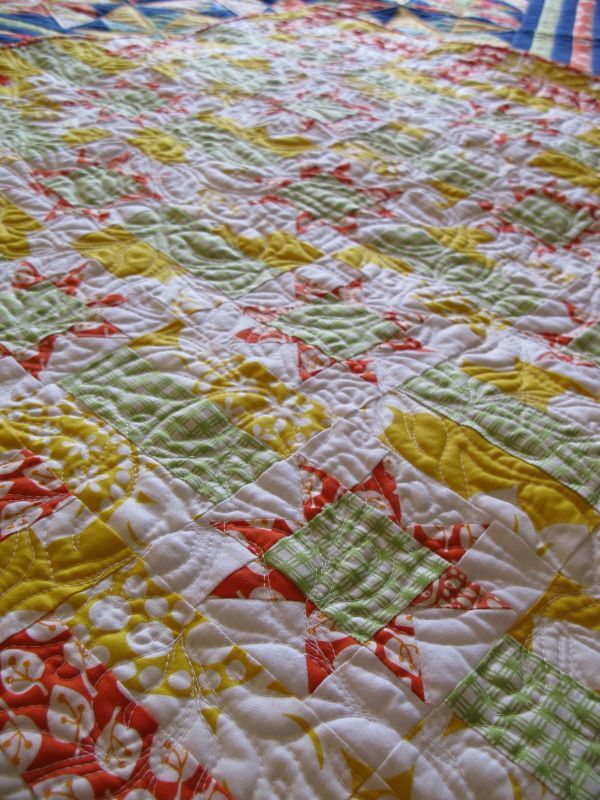 This quilt is my first finish on my list of things to do in the Third Quarter of 2013’s Finish-A-Long (FAL). It is #118 on my 200 Quilts List. Lovely post. Will miss you this weekend as we gather to connect or disconnect, coo at the babies and eat, eat, eat all in a day’s time. It’s very very pretty. The colours are just so pleasing to the eye. As always Elizabeth, the writer in you so aptly expresses the very essence of what we all share. Love of fabric and making something with our ands one stitch at a time. Beautiful quilts, and beautiful narrative about similarities and differences. 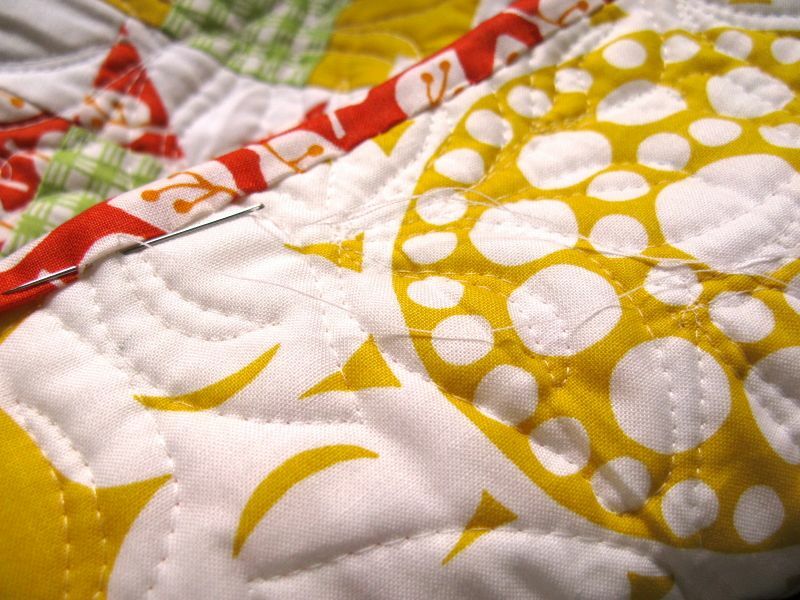 Your description of your quilting friends is also a good description for the activity you share–the piecing together of disparate pieces to make a beautiful whole. Your writing is so wonderful! I hope one day to be part of such a group. Until then I am enriched and encouraged by your words…. Elizabeth, this is a wonderful post! I have read it twice now, savoring every sentence. You have so beautifully described the emotions and the happenings of modern-day retreats as well as the same emotional aspects of the sewing circles our grandmothers participated in. This is exactly how I felt after my retreat in Wisconsin this summer…it was so hard to have it end! 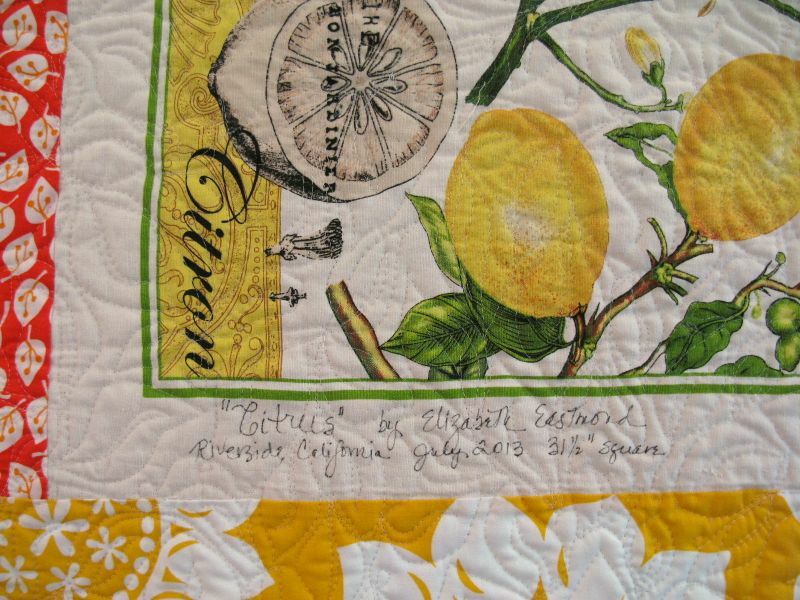 Love your citrus quilt and your wonderful commentary. Stitching close friends and bringing each other closer together! 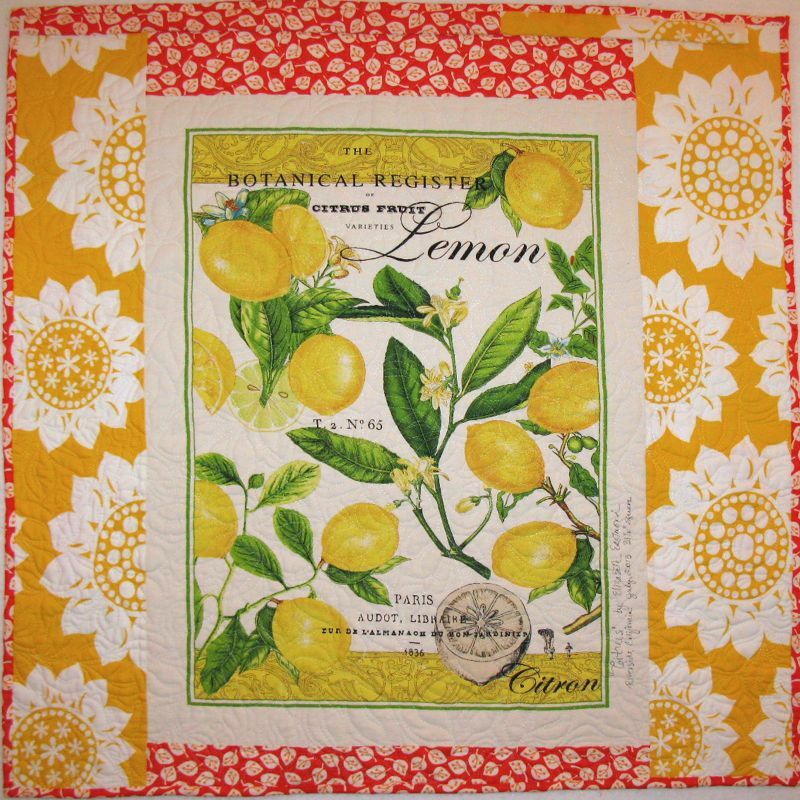 I love your Citrus quilt and using something like a tea towel in the backing had never occurred to me before…but now the creative juices are flowing with ideas for interesting backings. Thank you! The colors are all so wonderful, but I find that I get into color ruts too. I can’t wait to see what you choose next. retreat you just attended: I too just attended a 5 day quilt retreat at ASILOMAR and you beautifully and eloquently captured my experience and other quilters’ experiences at a retreat. There you are finishing yet another beautiful quilt. Your retreat sounds lovely as does your morning of sewing. 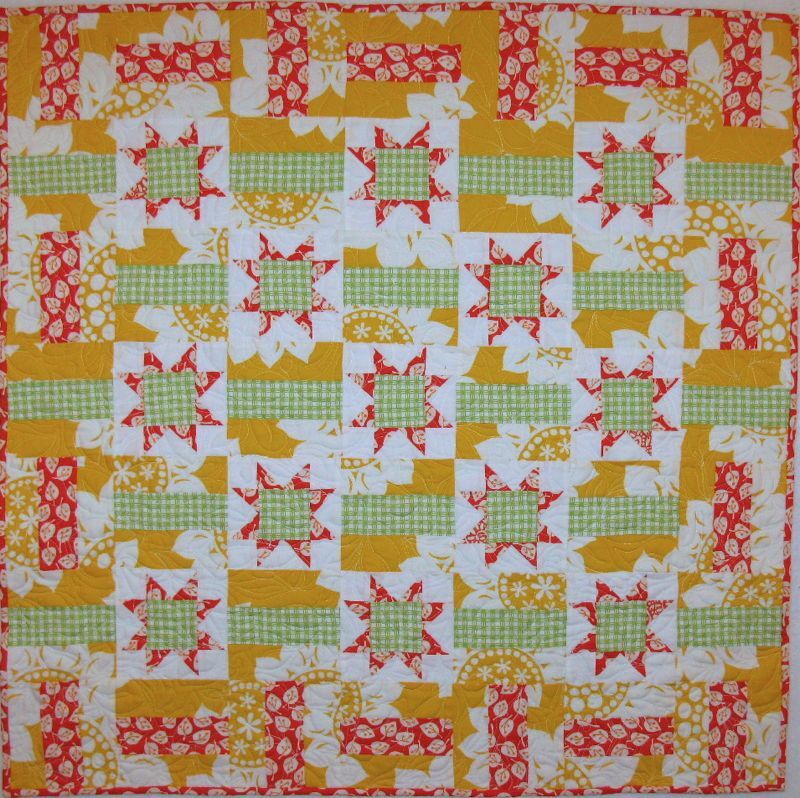 Pingback: Amish With a Twist 2–progress | OccasionalPiece--Quilt! I love your quilt – it is just delicious! Pingback: Giveaway Winners | OccasionalPiece--Quilt!